You have found the perfect spring jacket – it’s lightweight, waterproof, a great color, and you love the fabric’s texture. You take it home and model it for your partner. All of a sudden you see a tear in the lining you didn’t notice in the store. Your rush back and exchange it for one without a flaw. It all goes smoothly. When you make a purchase online, however, things are very different. You can’t see it, feel it, and try it on before you buy. If you know the retailer and have purchased before, then you have some level of trust that the item will be to your liking, that it will be shipped on time, and that if you have that tear in the lining, you can return it for another. If you don’t know the retailer, you hesitate – not just because of the item itself but because you now have to give lots of information – personal and credit card. You may be so hesitant that you decide to exit and look for a jacket from a retailer you know. The scenario above happens more than you probably can imagine. That online retailer may get a lot of traffic like yours. 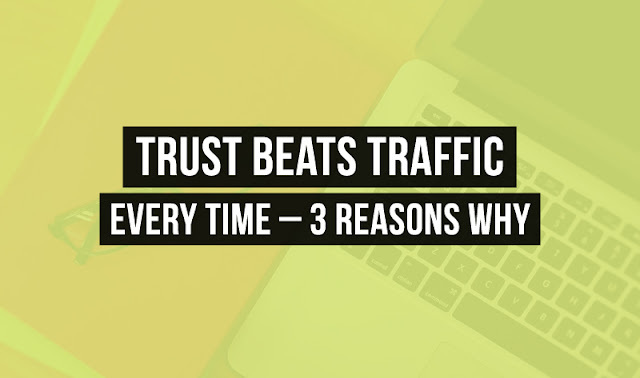 But that traffic doesn’t convert to sales because there is not enough trust. Which would you prefer? The traffic or the trust? No contest, of course. 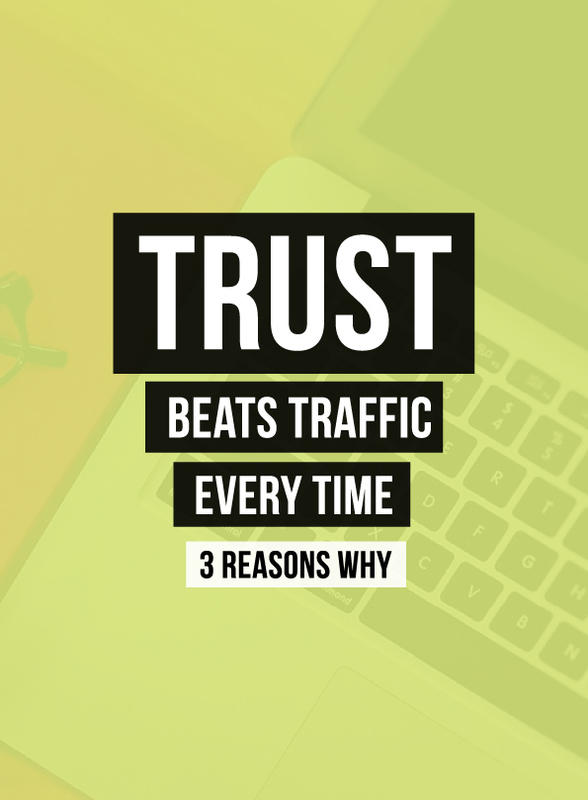 Here are 3 reasons why trust is your goal, not traffic. There was a customer service experience after the sale that ended well. That consumer now trusts you and, maybe with a little nudge from you, will be willing to share your brand with his/her communities. And if someone in their community needs a recommendation for the product or service you offer, they will provide your name. You get viable potential customers coming to your site, not just “lookers” who bounce without converting. These two generations make up a huge buying power, and they conduct more online researches and purchasing than any generation before them. But here’s the thing. They will not do business with any company they do not already know or that has not been used by others in their communities with a positive outcome. These groups use social media for their research, asking their peers about businesses they are considering for purchases. If others in their tribes trust you, they will too. You engage your readers/customers in conversation, answer their questions, ask for suggestions and feedback, and then ask them to share you with their friends on social media. You resolve any issue or problem immediately and to the customer’s benefit. You monitor the use of your name on social media so that you can respond immediately if there is a negative comment anywhere. There are good tools you can use for this. You feature your happy customers on your social media platforms and on your site. Businesses grow when the maintain contact with current customers and when they continually grow their email lists and followers on social media. Conversations with customers need to continue even when they are not purchasing right now. They need to continue on blog posts, and they need to continue on social media. If you want an example of how this is done well, check out the Facebook page and the Twitter account of ModCloth – an online clothing retailer. The conversations just keep flowing, and the company is engaging former, current, and potential customers every day. Use social media for entertainment and inspiration as well. Jack Daniels holds contests for the weirdest bar stories; Tom’s Shoes features its charity work all over the place. These are things that appeal to people and get shared. Use emails to provide humor and entertainment as well as to provide value, in the way of discounts and special sales to subscribers only. Loyalty is built over time, but when it is built, you have customers over the long-haul, not just for one-time purchases. When they need what you sell, they’ll be back because you have kept your brand in front of them even when they are not buying. Traffic? That’s just a vanity number. Trust? That’s where the sales and profits are. Diana Beyer is an experienced and self-driven creative director who is passionate about writing. Her purpose is to share some value among interested people. She is always seeking to discover a new way in personal and professional development. You may contact her through Twitter.